I always love a good co-op game, especially one that is made to play with other players in ways that can sabotage and mess up their progress. Dungeonland definitely supports both. 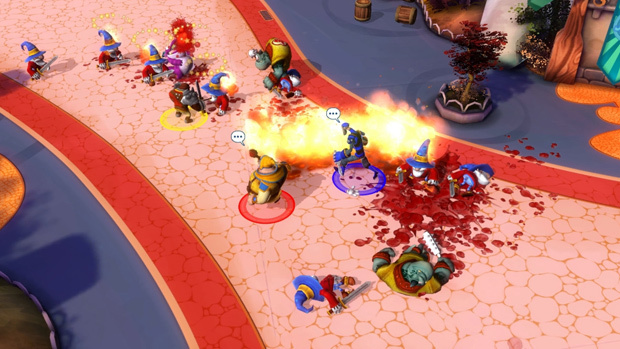 In this coop game you can play with 3 of your friends and go through the story of Dungeonland. This cooperative hack and slash game takes players through a theme park owned by an evil overseer that has only one goal, to kill you. This evil man will throw all sorts of monsters at you, and it is up to you and your friends or complete strangers to survive and get to the end of this theme park. And with a recent update, admission to the park is now free! Just like in many other coop games, there are a couple of classes that you can choose to use to go through this theme park. Each one of these classes has their own specialty, and each one also has an important role to fulfill. Let’s start with the Warrior, the tankiest of them all; he obviously is the shield of your little team and has to fend off the enemies to buy time for the other ranged classes. Next is the Mage. 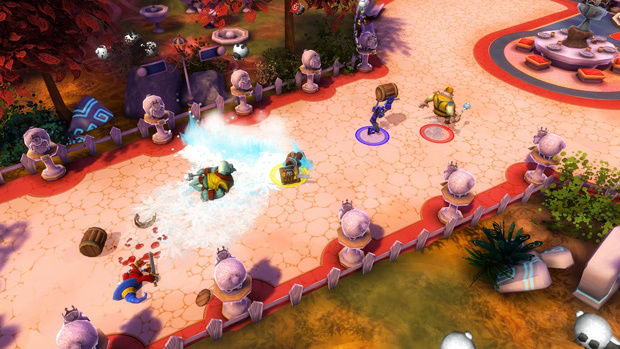 The Mage can shield units, heal them and do a lot of damage when left to his machinations. And last but not least is the Rogue, a class designed to deal maximum damage. However this Rogue throws knives and has quite a strange kit unlike most any Rogue class I’ve encountered before. The diversity of builds and strategies offered with this class is a breath of fresh air. Just be careful as attempting to master everything a class has an offer can leave you gimped. But luckily coins you collect from adventuring can be used to change your kit and test out entirely different builds and roles. Teamwork is essential while the dungeon maestro attacks you with endless waves of funny creatures. Whether laser shooting chickens, little grey minions, or purple dragons that spew fire at you, every monster has a trick or two up their sleeve that makes them just as dangerous as the bosses themselves. Luckily you will find chests and random objects that you destroy that include coins and food to heal you up. If you focus on only combat, these creatures will whittle you down over time so be sure to hunt for goodies whenever a break in the waves allows it. You will also find random sheep walking around that can be brutally murdered as sacrifices to gain health from whoever above is looking out for you. Morbid I know. Like I said, teamwork is essential, and you really have to keep your friends alive while you make your way to the end of the level. What makes Dungeonland so addicting is how brutal the missions are and how reliant you are on your allies to cover your weaknesses. You can also let a fourth friend be the Dungeon Maestro, and hear his endless laughing while you try to survive these dreadful monsters. Unfortunately the game is not completely free to play, there are only a couple levels that are currently available to people that have not bought anything in the game. And on top of that you are also able to use your real money on spawner packs and other items that the classes are able to use. As a Dungeon Meastro, you will have complete control over the dungeon, and that’s where the spawner packs come in. Each one of these packs include different monsters that you can control and use, and since your one goal is to kill the heroes in your dungeon, it can definitely help out to have a good monster pack. As a free to play player, there is not a heck of a lot that you can do. Only a couple game modes are available to you. In the end it’s clearly a marketing gimmick to get you hooked into purchasing the full title. But even if you purchase the game, there’s still an item shop where you can purchase in-game items to further bolster your chances of success. This would amount to a pretty major problem if the game wasn’t so inexpensive. I purchased everything I wanted in the end for only a couple dollars. If you do not have friends to play this game with, don’t worry you can also play with or against the AI. 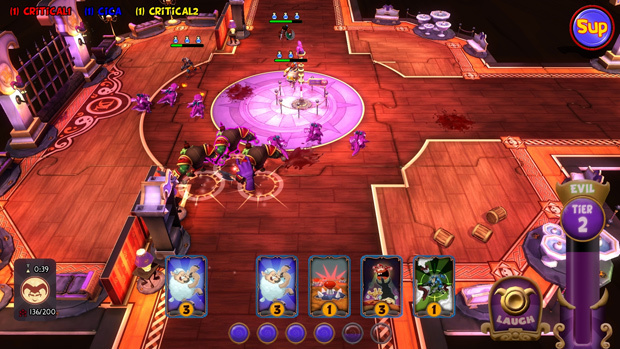 You can even play the Dungeon Maestro while heroes controlled by bots venture through your dungeons. But obviously this is not as fun as playing with your real friends, though it can do in a pinch when boredom reigns supreme. 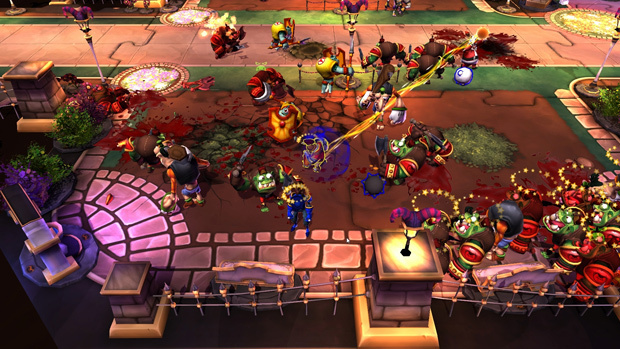 Dungeonland is a lot of fun. Playing this with my closest friends as well as people from the Internet has entertained me thoroughly. When I got the game, I didn’t have all the access yet since they advertised this as free to play. But there’s enough content there to build an addiction, so be warned if you’re trying to avoid spending any money on a game. Each hero or even the Dungeon Maestro is a lot of fun and the full game has enough content to keep you entertained as you explore the various storyline runs as one of these available roles. Even if you do not have friends to play this with, this game is a great way to make some.